Imagine re-reading your favorite childhood novel as an adult but doing so in picture form. For instance, imagine Harry Potter as a graphic novel 30 years from now (Wait, actually that’s an amazing idea and someone with talent should start sketching NOW). That’s what illustrator Hope Larson did with her favorite novel growing up, Madeleine L’Engle’s A Wrinkle In Time. According to Huffington Post, Larson had given up illustration altogether; that is, until she was approached to illustrate her favorite novel as a child and turn it into a graphic novel. That’s exactly what she did. L’Engle’s A Wrinkle In Time is now available as a roughly 400-page graphic novel. Larson told Huffington Post she had some concerns about putting the novel together. What if I couldn’t do the book justice? What about the people-the people on the Internet-who throw up their hands and moan about their ruined childhoods whenever anyone adapts anything? Neither of those thoughts was as frightening as the possibility that someone else, someone who didn’t love the book as much as I did, would take the job and make a mess of things. I agreed to do it. Personally, I think it’s kind of a great idea. What books/classics would you like to see turned into graphic novels — besides my already awesome Harry Potter suggestion? 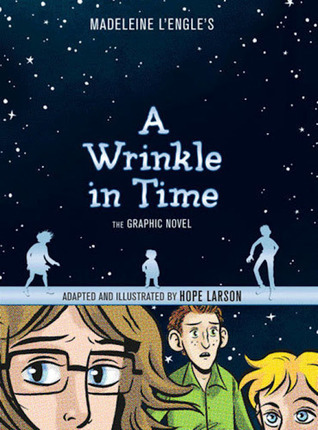 Get A Wrinkle in Time: The Graphic Novel in hardcover for just $11.10.